Louet Gems 100% superwash merino, light/sport weight, in colorways (left to right) Bluebird, Cherry Red, Pink Panther, Caribbean Blue, and Fern Green. The store was very sweet -- it's an old house that's been converted to a store, so there are several little rooms with shelves full of yarn in each. They carry basics like Cascade as well as Berocco and Dale of Norway, and they have a great selection of Claudia's Handpaint and Cherry Tree Hill sock yarns. But I went straight for the Louet, simply because I've never tried it before but have heard great things about it. And before you make any comments about the amount of sock yarn going into the stash, let me tell you that only two of these skeins are intended for socks for me. J will be getting socks from the two skeins on the left (can you believe it? -- colors!) and the green is for socks for my future mother-in-law. 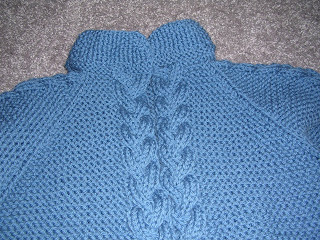 I have roughly 10 rows left to knit, two seams to sew, and five buttons to sew on. Think I can finish tonight? I am so relieved that these are finally done. As I mentioned before, this yarn is less than exciting to knit with; fortunately this skein didn't shed the way the first skein did. The real reason for knitting this yarn was that I knew these socks would soon become among my favorites once I finally finished them. I throw these in the washing machine and the dryer; they shrink up a bit but them stretch nicely to hug the foot, and they're the most cushion-y, squishy socks to wear. 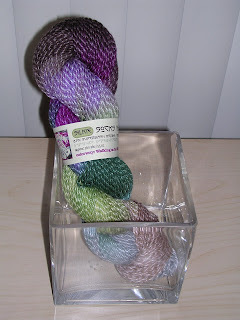 One thing I did love about this yarn is that it behaved extremely well for a variegated colorway. It's hard to capture the full range of color on camera -- there are shades of pinkish purple, periwinkle, turquoise-y blue, and very pale blue -- but there was absolutely no pooling with this yarn. You can see that the overall tone is purple, and I have to say that the color does remind me of a winter sky (ever notice that in the winter, when it's been snowing, the light is kind of purplish?). These are ready to go in the wash in anticipation of their first wearing. I took a day off yesterday and got half of the second sleeve of my Forecast done after finishing these socks. 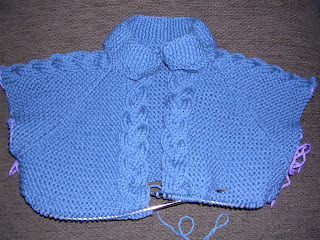 I was planning to try to finish it this weekend, but it looks like I'll be turning all my attention (for the time being) to the Baby Surprise Jacket -- we heard this morning that my cousins had a baby boy! I'm glad I put the BSJ aside for a bit; now I'll know which side to put the buttonholes on and I can make some boyish accessories to go with it. I have a new cousin, yay! *Further evidence that these socks were the equivalent of a black hole of knitting -- since when does it take me more than two weeks to finish a pair of simple stockinette socks?! This evening I arrived home much later than usual and utterly exhausted, having worked a full day, run an errand, and gone to a meeting. I was preparing to wolf down my leftovers from last night's stir fry, put on my pajamas, and make like a couch potato -- except there was a little pick-me-up waiting for me: my April Rockin' Sock Club shipment! For the sake of those of you who have not yet received your shipment and want to be surprised, I won't say anymore. Those of you who would like to see it and hear about it, bear with me for a moment. Walking on the Wild Tide! 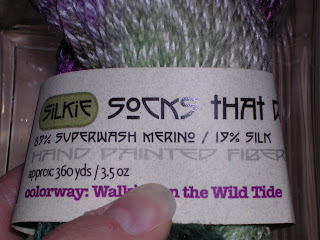 This is Socks That Rock Silkie, a blend of 89% superwash merino and 19% silk, which apparently yield a 108% wonderful and delicious sock yarn. I'll admit that I had peeked at photos posted on blogs of those who had already received their yarn, but this skein is even more beautiful in person. What looked like plies of white mixed with the color is actually plies of a lighter shade of each color, and the colors themselves are classic Blue Moon -- rich and vibrant. I can't wait to see how this knits up. I guess I really have to finish the Most Boring Socks Ever now, don't I? Knitting progress is being made here in the Knit/Wit house, although knitting time is competing with walking time now that the weather is cooperating again. J and I went down to the "jail trail" (a paved trail that begins at the county jail and runs between Second Avenue and the Parkway East) on Saturday. He rollerbladed while I walked the equivalent of a 5K and tried to ignore the catcalls coming from clearly bored drivers sitting in construction traffic on the parkway (listening to episodes of Lime and Violet helped). I went out to walk again after J left on Sunday evening, this time through the hilly terrain of the cemetery across the street, with soundtrack provided by the latest episode of Cast On. If anything, the warmer weather has been serving as good motivation to finish knitting a heavy, 100% wool sweater. 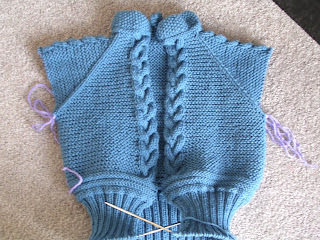 Forecast is moving along; we've now got half a sleeve, which will see lots of ribbing action tonight. 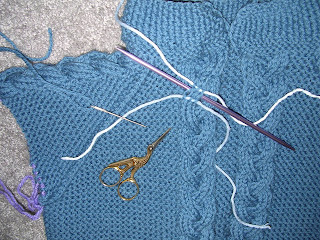 It's a little hard to see, but I've made a mod that seems to be pretty popular among participants in the knitalong -- starting the ribbing a little higher on the arm than called for in the pattern. In my case, I'm starting it roughly at the elbow. As usual, I also have a pair of traveling socks going (as I do at all times). Unfortunately my current socks have seem to have become Most Boring Socks Ever. They're a basic stockinette with short-row heels and toes, which usually isn't an issue for me, since I can knit stockinette very quickly without looking. I think the problem with these might be the yarn. This is Greenwood Fiberworks cotton/lycra blend, which is my absolute favorite to wear (you may recall that I wore out my first pair knitted with this yarn). While I love how soft and squishy these socks are once they're done and on my feet, I've come to realize that I just don't care for knitting with this yarn. It's a tad bit fussy (especially when you try grafting with it or trying to weave in the ends) and because of the elasticity of the lycra the stitches squinch down on themselves, meaning that the number of rows per inch is a lot higher than I'm used to, meaning these are taking forEVer to knit. I am determined to finish these in the next few days, if only to be done with them once and for all, but also because my next Rockin' Sock Club shipment should be on its way this week. 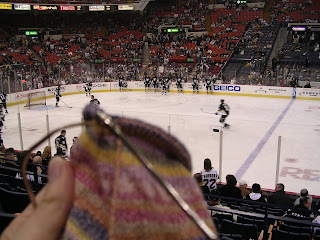 Aside from this knitting, I've been enjoying another pasttime. Can you keep a secret? I've been reading again. If you've been reading this blog from the beginning (or perhaps gone back and read old entries), you'll know that I used to read all the time for pleasure. Then I started my new job, for which I read all day. And for about the first year, the last thing I wanted to do was read; that's probably one reason why I started knitting so obsessively. In the past few months, however, I've been able to read for a little bit each night. At first it was Elizabeth Zimmermann and Stephanie Pearl-McPhee. Then, lately, I've been moving back into more serious (read: non-knitting) books. I finished Mockingbird, a biography of Harper Lee, the other night. To Kill a Mockingbird has long been one of my favorite books, and I loved getting an inside view of the woman behind it. You will remember that at knit night on Wednesday I made a most unfortunate discovery -- a mis-crossed cable near the top of my Forecast. 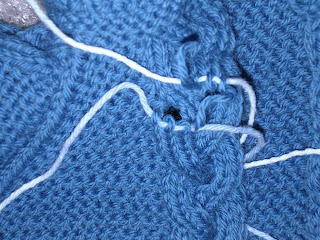 Frogging was not an option, as far as I was concerned, nor was unraveling/dropping the stitches in the cable and reknitting them the Weirdy Pants way. The only option was the take out the scissors and do some sweater surgery. 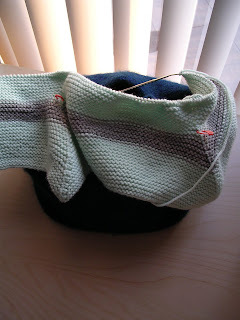 I isolated the row of stitches that would be unraveled by putting a spare dpn underneath it. Using some smooth scrap yarn (in this case some discloth cotton), I installed some lifelines through the stitches in the rows directly above and below the row to be unravled. I had at the ready my embroidery scissors (small, exact blades to ensure I only cut what I wanted to cut) and a length of sweater yarn on a yarn needle. ... and unraveled the three stitches in this row. 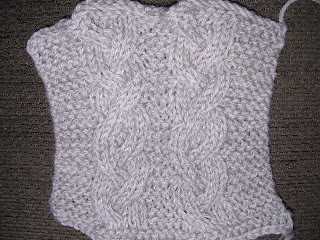 The stitches in the row above and below remained safe on the scrap yarn. I placed the stitches on the scrap yarn onto two size 6 dpns (smaller than what I'd used to knit this portion of the sweater). 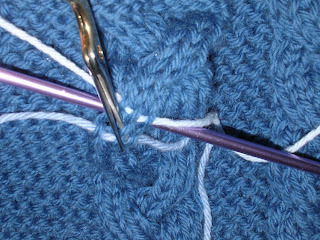 Then, carefully, I eased the dpns under the band of stitches that were previously the bottom part of the cable. Essentially what you're doing here is taking the stitches that were in the front of the cable cross and pulling them behind to the back. Success! Many thanks to Cara for her very helpful tutorial; I followed her instructions to the letter, and you can see they worked beautifully. Now that that is behind me, I am ready to pick up on this baby where I left off. 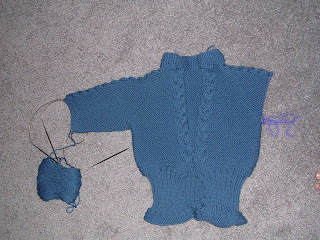 I finished the body Thursday night and am now ready to begin the sleeves -- you can bet I'll be watching my cables closely from now on! I was planning a really happy post this evening about how wonderfully my Forecast was knitting up and how gnomes must be at work because it was knitting up so quickly. I was planning to be all sunshine and daisies and Ain't Life Grand, waxing poetic about how fabulous this sweater was and what a genius I was for making the modifications. That's what I was planning. That is not what this post is going to be like. NOOOOOOOOOOO! You would think I would have missed crossed a cable further down (keep in mind this is a top-down construction), when I was supposedly so used to the pattern that I didn't need to pay attention. Apparently not. Apparently my brain decided to shut off right as I was starting the cabling and fail me on my third cable turn -- and then apparently fail again and again to the point that I didn't even notice this mis-crossed cable every time I came to it. Fortunately this discovery was made in the presence of Jenn, Fixer of Mis-Crossed Cables Extraordinaire. She reminded me of how she had documented the fix she performed on an errant cable cross in The MWP's sweater, a post that later wound up in an issue of Yarnival. 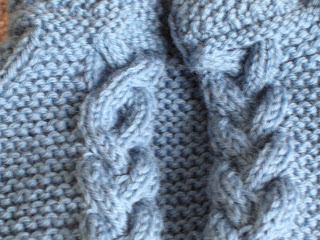 When I expressed concern that I couldn't unravel and reknit the way she did on account of the cable being right along the edge, she reminded me that the very talented Cara had actually taken scissors to her cable and had documented it on her blog. So, tonight there will be swatching and practice surgery in preparation for the real thing (kind of like how Christina had Burke practice surgery on chickens on Grey's). I will be documenting the whole process here, so all you faint of heart, be prepared. See you and your knitting there! We are back from a super-speedy trip to Cleveland (we left at about 11:30 on Saturday morning and were back by 2 on Sunday) for J's cousin's Bat Mitzvah. It was a fun, somewhat crazy weekend, including such good times as me trying to walk in about an inch of slushy snow in heels. As you can see, I've already modified the cable pattern. I decided that bobbles just weren't for me (too nipply for my taste) and I thought the cable would look empty without them, so I substituted a braid cable instead and am very please with how it's working. My one concern right now is that it looks rather small. I've remeasured and I am getting stitch gauge, so I'm hoping it will open up with blocking and the stretchiness of the fabric in general. I also keep reminding myself that the button bands are yet to be knitted on, which will give me another inch or so in width. I'm going to knit away on this tonight while watching my latest Netflix DVD. There's still snow in the forecast for at least the next day, so I may even be able to wear this baby once this year if I can finish it quickly enough. Pattern: 2x2 rib leg, slip stitch heel, stockinette foot, and wedge toe, worked over 72 sts. Can you believe J would have picked such a bright colorway? But it's true -- I had no say in the selection of this particular skein of yarn. I found the yarn in a box (that's right, it wasn't even unpacked and on the shelves yet! ), but the colorway I picked out was shades of blues and tans and browns. Much more mellow. But the manager, ever the enthusiastic yarn-pusher, insisted that J look through the colorways and even take the unopened bags of yarn outside to look at them in natural light before making a selection. And this is what he settled on. Needless to say, they're a bit baggy on me, but you've seen that they fit J perfectly. Although I followed my basic sock pattern for these, I enlarged them to 72 sts to account for the cotton content of the yarn (i.e., it's not as stretchy as wool, and it may shrink a bit in the wash). 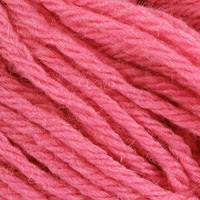 I did notice a definite difference knitting with cotton as opposed to wool, but the yarn itself is soft and comfortable. There's another skein of similar fiber content that was purchased at the same time that's in a more J-friendly shade that is more likely to become part of J's regular wardrobe; these are a bit loud for him and are likely to be house socks only. With me in my Inside Out socks, won't we be a fashionable pair? 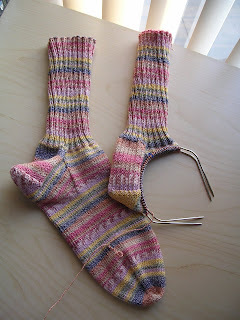 Becky had been so kind to me throughout the Sockret Pal swap period that I knew I wanted to send her a pair of socks as a thank-you. Of course, I didn't know who she was or how long her foot was, so I knit these through the gussets and then let them sit until she revealed her identity. 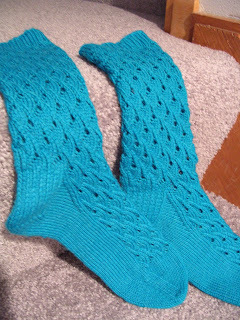 Then I was able to do the last bit of detective work to find her measurements, finish the socks, and send them off. She received them in the last day or two; she told me she was wearing the socks that moment, so I can only assume they fit! I don't know if I've gotten this pattern out of my system for good, as I know I will inevitably come back to it. But now I am ready to move on to some other Nancy Bush patterns so I can use up the copious amounts of sock yarn in the stash. Up next, however, is a pair of basic socks in the Greenwood Fiberworks cotton/lycra sock yarn to replace my beloved Mata Haris. And I think I may start a sweater for the car trip to Cleveland -- can you hear the siren call of the yarn for Forecast from within the stash? *Yes, I do know all the lyrics to Joseph and the Amazing Technicolor Dreamcoat. You got a problem with that? 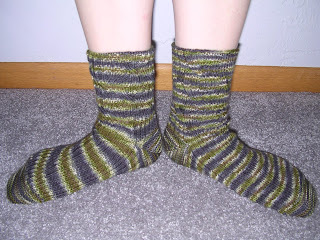 I used the same size needles throughout these socks, but I maintained a tighter tension for the foot. This meant that the knitting was rather rough on the hands and wrists, which probably explains why it took me so long to knit them -- I had to have a rest in between sock one and sock two. These were my first Socks That Rock. Although I wasn't exactly wild about the colorway or the pattern when I started, I kept reminding myself of the reason I signed up for the club in the first place -- to try something new. 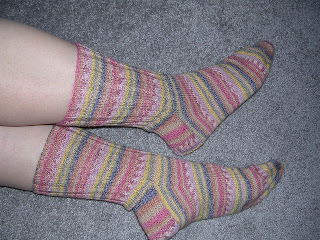 These turned out rather thick, so they will probably be house/bed socks. My favorite feature is the ribbing on the sole of the foot. 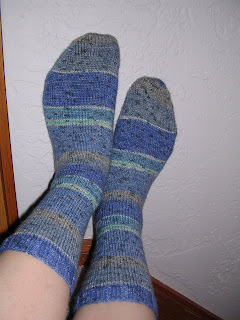 It mystified when when I knit it -- until I finished the first sock, put it on, and walked around a bit. Pure genius. So cushy and comfy. This was all the yarn I had left. 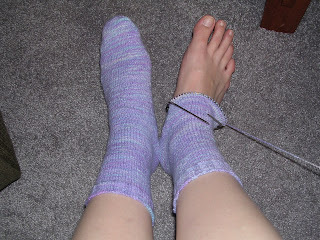 Not bad, considering my foot is 9.75" long and I worked five cables plus 10 additional rows (60 rows total) on the leg. J's crazy socks are the next WIP that will get attention. They have only about four inches of stockinette left on the foot. To answer your question, Ruth, the yarn is Online Supersocke Cotton Beach Color (frankly this colorway doesn't scream "beach" to me, but that's what it's called). They will see significant attention tonight and tomorrow, and with any luck there will be another object finished here tomorrow. There have been no exciting knitterly goings-on here in the past few days, so in an effort to keep you entertained (all two or three of you who are still reading), I've decided a run-down of the WIPs is in order. 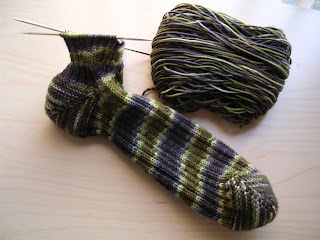 First up are the wild 'n crazy socks for J. Sock #2 is now into its gussets. The leg of this one went much faster than the leg of sock #1, but I seem to be losing momentum (not helped by the fact that I did not take lunch today). My goal is to finish this one up by the end of the week, as we are taking a quick trip to Cleveland and I'd like to take something new for car knitting. 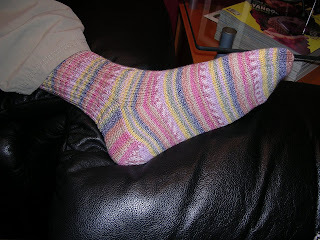 Next up is the second Inside Out sock, aka the February sock from the Rockin' Sock Club, aka the phallic sock. I'm ready for my second (of five) cable rounds, which means I have roughly 30 rows left to knit. I'm going to do my darnedest to finish this baby up tonight. 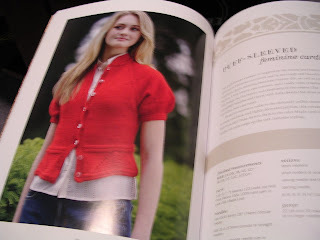 Here comes perennial Elizabeth Zimmermann favorite, the Baby Surprise Jacket. (That blue lump it's sitting atop is my French Market Bag, which is finally being used to hold yarn instead of just looking pretty.) I haven't touched this in at least a week, but really I haven't felt any urgency to work on it. The recipient-to-be isn't due to make his/her arrival until mid-May when, with any luck, it will finally be spring in the greater Chicago area, meaning baby cousin will not be in desperate need of wool sweater. Shedir. Did you forget I was knitting this? So did I. I probably could have used a new hat in the past week, but it looks like it's finally going to be getting back to normal spring temperatures in the next few days. Again, no real urgency for wool. I'll finish it eventually. What is this? It's the tube scarf I started for my mother -- on or around Christmas of 2006. The yarn was purchased Thanksgiving weekend of 2006. Mom hasn't asked about it since I started it (although she'll probably see it now and want to know where it is, which will be just the kick in the pants I'll need to finish this). WEBS and UPS have informed me that my yarn has been shipped and is due to deliver tomorrow, so there will be a little winding party here tomorrow evening. Perhaps I'll have a finished object report for you as well -- watch this space! Last night J, the sock, and I (along with my dad and a friend of mine) headed downtown to the Igloo for the last regular-season Penguins game. A good time was had by all. Here are a few highlights of the evening. The sock and the Pens warm up before the game. We watch Sidney Crosby (#87) and Colby Armstrong (#20, who we decided looks like Tommy from the Rugrats) stretch. We're a bit disturbed that they're more flexible than we are. 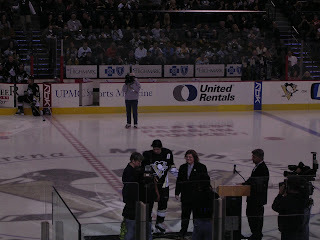 Sid receives yet another award before the start of the game -- d'you think this guy is tired of hearing chants of "MVP" yet? 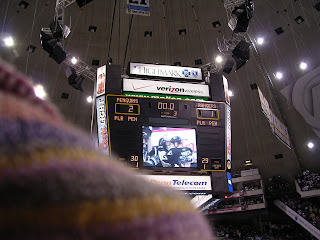 The sock celebrates a win -- Pens 2, Rangers 1! Looking for the baby sock pattern? 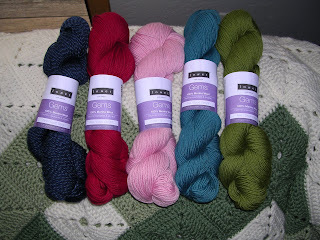 I didn't mention it the other night, but I had a moment of weakness and broke my so-called yarn diet. If you've ever bought anything from the yarn mecca that is WEBS, then surely you've received mailers and/or e-mails and/or have otherwise heard that they're having a big anniversary yarn sale. I've had a very weird urge to knit sweaters lately, and when I saw that their sale price on Cascade 220 -- believed by some to be The Perfect Yarn -- was a mere $4.89 a skein (sorry if I'm enabling anyone here), I almost immediately bought up two sweaters' worth. I justified these purchases by reminding myself that I got my tax refund only a few days ago and this yarn only cost about a fourth of what I got back. However, there will be no more buying of yarn (not with my own money, at least) in the near future, as I have to take in my car for its state inspection tomorrow and then we're off to pick up our wedding bands. These sweaters and all my sock yarn will have to be enough for a while! And I'm planning to use Cascade 220 in color 7805, which seemed to be called Bright Pink when I made my purchase but is now listed as Flamingo Pink. 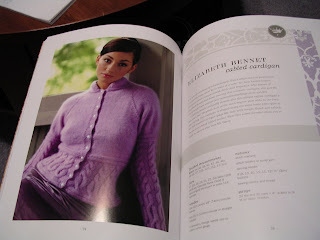 The other sweater is the reason I bought the book: the Elizabeth Bennett Cabled Cardigan. Not only did the sweater appeal to me, it's named after one of my favorite literary characters -- how could I not knit it?! The yarn called for in the pattern is an agora blend, which I immediately nixed. I'm not allergic to angora (as far as I know), but I just don't like it. 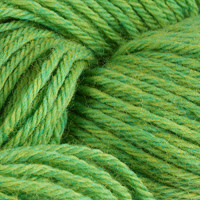 I think the Cascade 220 in colorway Lime Heather will make a very nice substitution. The subtle blue-green flecks in this heathered shade should add some great color play to the texture of the cabling. I can't wait to knit this one up, even if it'll be a while before I can wear it. If the current weather trend (ahem, it's SNOWING outside!) continues, I will be perfectly happy to sit with a lapful of wool. Tomorrow night: J's newest and most outrageous sock to date goes to the last Pens game of the regular season. Pictures to come. 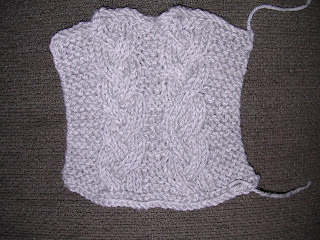 As promised, the following is the pattern for those baby socks the Yarn Harlot liked so much. I'm calling them Baby Ribs (and I'm taking no responsibility whatsoever if you get the Chili's song stuck in your head). 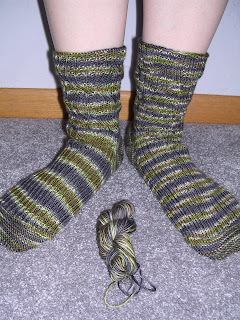 This pattern assumes that you have knit socks before and are familiar with sock construction. However, if you encounter a problem, please feel free to e-mail me and I'll do my best to help you through it. 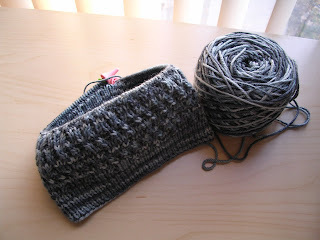 Cast on 40 sts and distribute them evenly over 3 needles. Join for working in the round, being careful not to twist. Work (k2 p2) rib around for 20 rounds. K 9 sts on needle 1, turn. Sl 1, p 19, turn. Redistribute sts so that 20 heel sts are on needle 1 and 20 instep sts are held on other two needles. 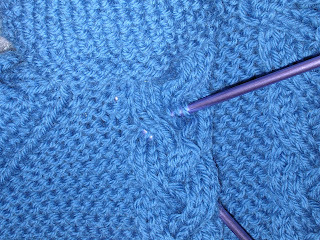 Work heel flap back and forth on needle 1. Work Rows 1 and 2 ten times total. Row 1: Sl 1, k 10, ssk, k1, turn. Row 2: Sl 1, p 3, p2tog, p1, turn. Row 3: Sl 1, k to one stitch before gap, ssk, k 1, turn. Row 4: Sl 1, p to one stitch before gap, p2tog, p1, turn. Repeat Rows 3 and 4 twice more, until all sts have been worked. 12 sts remain. With needle 1, k across 12 heel sts, then pick up and k 11 sts on side of heel flap. 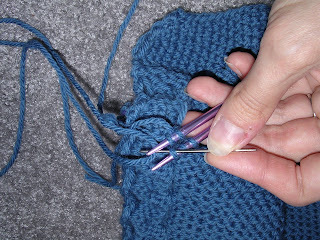 With a new needle (now needle 2), work across all instep sts in rib pattern as established. 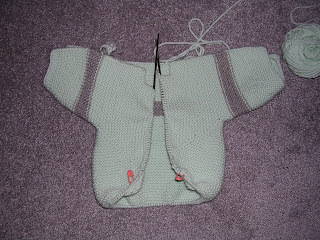 With a new needle (now needle 3), pick up and knit 11 sts on other side of heel flap and k 6 heel sts from needle 1. You will now have 17 sts each on needles 1 and 3 and 20 instep sts on needle 2 (54 sts total). *If desired, an extra stitch may be picked up between the end of the stitches at the side of the heel flap and the beginning of the instep stitches to prevent a hole. If you do this, just be sure to work two additional gusset decrease rounds. Row 1: K to last 3 sts on needle 1, k2tog, k1; work instep sts in pattern on needle 2; k 1, ssk, k to end on needle 3. 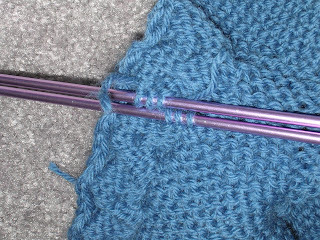 Row 2: K all sts on needles 1 and 2, work in pattern on needle 2. Repeat Rows 1 and 2 six more times, until 10 sts remain on needles 1 and 3 (40 sts total). 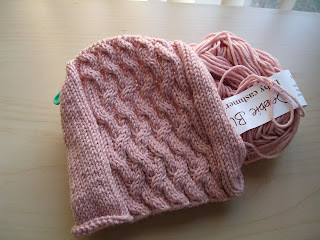 Work 8 rounds even, keeping needles 1 and 3 in stockinette and needle 2 in rib pattern. Work one more round, knitting all sts. Row 1: K to last 3 sts on needle 1, k2tog, k1; on needle 2, k1, ssk, k to last 3 sts, k2tog, k1; k1, ssk, k to end on needle 3. Repeat rows 1 and 2 three more times (16 sts decreased; 24 sts remain). Then repeat Row 1 only three more times (12 sts remain -- 3 sts each on needles 1 and 3 and 6 sts on needle 2). Using needle 3, k across sts on needle 1 so that all 6 sole sts are now on one needle. Cut yarn, leaving an 8-10" tail. Use kitchener stitch to graft toe stitches. Weave in all ends and block as desired. 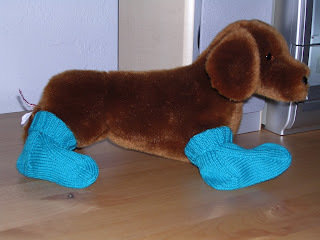 Baby Ribs Socks look as adorable on stuffed daschunds as they do on babies. I am so amazed at the number of visitors I've had to my site since Stephanie linked to me. Thank you to those of you who left me a comment -- it's been so exciting to see where you all are and discover new blogs as a result! I am slowly working my way through responding to all the comments, replying by e-mail when I can and leaving comments on blogs when I can't. For those of you who I can't contact either way, thank you for stopping by! I think that Rev. Linda said it best -- this is truly a communKNITy. It's wonderful that we can find each other and get inspiration from one another thanks to the wonder that is the World Wide Web (or the Internets, if you prefer). I hope you'll continue to stop by my little knitblogging corner of the world from time to time so that I'll remember to visit your blogs and see what wonderful things you're creating. I've had at least one request to post the pattern for the baby socks that Stephanie mentioned she'd seen on my blog when she visited. (For the record, yes, I was surprised that she'd been to my blog, but more so that she remembered what I'd just knit -- sometimes I don't even remember what I've just knit! Why do you think I keep a blog?!) I'll be posting that pattern later this week, so check back. I tried very hard to get the striping to match up, which wasn't as easy as it is with self-striping yarn with shorter color repeats. I did not pay much attention to where in the pattern I started the first sock, so I was very lucky to be only about a row or two off in the second. These feel absolutely fabulous on, and I'm counting on them softening up my feet. Today it's a bit warm for wool socks (we hit a high in the upper 70s), but it looks like I only have to wait two days to wear these -- would you believe it's supposed to snow on Thursday?